The Hair Chiasso! 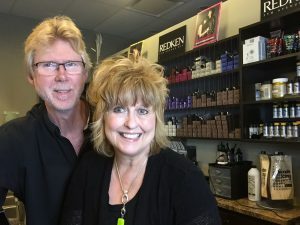 Salon is recognized for their highly skilled team of Salon Professionals who offer cutting-edge styles and customized services in a fun and relaxing environment. Our team includes; Redken Certified Haircolorists, Redken Design Stylists as well as highly skilled Nail Technicians and Estheticians. We provide our guests with fashion forward services using new and advanced techniques and products. The Hair Chiasso! Salon is a “Redken Elite Salon”. Our Stylists & Colorists receive Redken education that inspires, and provides the latest training in Styles, Trends and Fashion. We utilize the latest products and techniques that will enhance the salon guest experience and assure your total satisfaction. The Hair Chiasso! Salon is a World Class Bioelements spa. Our Skincare Specialists are trained by Bioelements on the latest skincare technology available to Salons and Spas. Custom blended methods from your skin care professional will create a product & service specific to your skincare needs and take home maintenance program.